It will be a night of the Blues at the Roots Music Series at the Pioneer Museum in Fredericksburg this Saturday, August 18. Lincoln Durham is an up and coming gritty and gripping blues singer/songwriter who has caught the attention of blues aficionados. Soul Track Mind is classy Southern group that plays a blend of soul, blues, funk, jazz and rock. 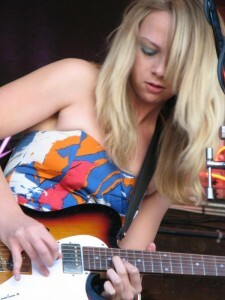 Samantha Fish is a young Kansas City native singer/guitar player who plays blues influenced by boogie and rock. The Longhorn Street Cafe will be on the grounds grilling up ribeye or thick cut pork chop with veggie medley, wild rice, dinner roll, and apple cobbler, all for $10. Gates open at 5 p.m.
Wine, beer, sodas, and water are available for purchase. Parking is free, and guests are encouraged to bring a folding chair. All museum buildings will remain open until 7 p.m. for Roots guests. Admission is $12. Students high school age and younger are free. A $2 discount is available for advance online ticket sales or web page printout at www.pioneermuseum.net. The Pioneer Museum is located at 325 West Main Street in Fredericksburg, with event entrance on Milam Street. Net proceeds support the mission of the Gillespie County Historical Society. On September 22, the Roots Series will host American Decades Night. For information: 830-997-2835.